Chemillé, FRANCE – The CIRCOR Aerospace Products Group, a business unit of CIRCOR International (NYSE: CIR), has been selected by SAFRAN / Messier-Bugatti to design, develop, and manufacture a complete suite of new, integrated speed sensing and control solutions for the Airbus A350 XWB, including the landing gear wheel tachometers and cockpit brake pedal transmitter units. CIRCOR Aerospace will develop these precision controls using its global engineering resources and perform final assembly and testing at its Bodet Aero Chemille, France facilities, with support from our Tangier, Morocco ATLAS Productions subsidiary. CIRCOR Aerospace was previously awarded the design and development contracts for the A350 XWB landing gear door actuators and landing gear hydraulics control manifolds. The award of these three component packages positions the CIRCOR Aerospace team as a major system partner to Messier-Bugatti for the A350 XWB program. 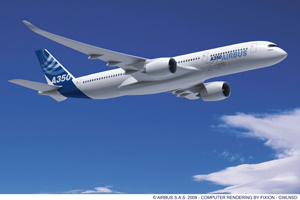 “The CIRCOR Aerospace team in France is proud to be a key partner to Messier-Bugatti on the Airbus A350 XWB. The Bodet Aero business has a long history of providing integrated controls technology to Messier-Bugatti and the contract for this new technology affirms our leading position in sensing and controls,” said Jacques Bodet, Director General for CIRCOR – Industria and Bodet Aero in France. Bodet Aero in Chemille, FRANCE and Atlas Productions in Tangiers, MOROCCO were acquired in 2009 by the CIRCOR Aerospace Industria Controls France business unit. Bodet Aero designs and manufactures electromechanical actuation and control sub-systems for extreme aerospace environments. Bodet Aero tachometers and brake pedal transmitters are on all Airbus program landing gear and braking systems, Dassault defense and business aircraft, as well as other commercial and air transport, and rotorcraft platforms. Bodet Aero designs and manufactures a variety of electromechanical actuators, position sensors, brushless DC motors, mini-gearboxes and reduction gears for the commercial aircraft sector. More than 25,000 units are currently in use by more than 100 airlines. Located in Chemillé, France, Bodet Aero has been manufacturing for over 25 years and is a subsidiary of CIRCOR Aerospace Products Group.